Siddhanth Hiremath from Bangalore, B.E. - B.Tech Graduate. Siddhanth Hiremath is Intern and currently have no work experience. DATA ANALYTICS STATISTIC COST ACCOUNTANT MANA.. OPERATION MANAGEMENT.. MS EXCEL R PROGRAMING ECONOMICS FINANCE ACCOUNTS OR..
are one of expert skill area's of Siddhanth Hiremath . 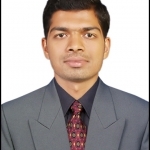 Siddhanth Hiremath is working in IT Software industry.